If you are still reading, then let me first explain more about what seed starting mixes are? 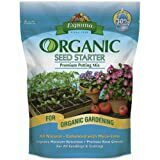 What is Seed Starting Mix? Starting mix is the media made specifically for seed germination. Gardeners use it to plant vegetable seeds to get a head start before the season, or if they have problems in their soil that reduce germination rate. Why are they made specifically for seed germination? Since young roots don’t have enough strength to navigate through thick soil such as topsoil mixed with organic materials. They need a thinner and easy to navigate media. Water is the most important factor when it comes to germination. It plays a big role actually. For a seed to germinate it has to absorb a lot of water first to break its coat and second to activates its enzymes which break down the food reserve into chemicals to be used in the plant’s metabolism. It is like your car key. Without it, you can’t drive your car anywhere. Oxygen soil ratio is another very important factor for seed germination. Root growth is very sensitive to oxygen ratio in the soil. If roots didn’t get enough oxygen, its growth will be Inhibited and the whole plant will not grow to its full potential. A project between the Department of Irrigation and Soil Science at Los Angeles and the Department of Soils and Plant Nutrition at Riverside shows the reaction of sunflowers root growth toward various oxygen treatments. If the oxygen diffusion rate was under 40, improvement to soil aeration should be made for ideal plant growth. If the diffusion rate was under 20, roots will not grow. You can tell that these roots in the picture above belong to a full grown plant, yet oxygen still affects its growth dramatically. That’s why oxygen is even more important in the early stages of germination. Because seeds depend on oxygen as the main source of energy, until the first couple of leaves grows and starts photosynthesis. Now let me show you why some gardeners prefer seed starting mixes for sowing seeds indoors, under the light of these germination requirements I just mentioned. A good mix depends on its ingredients because it gives it the characteristics it needs for seed germination. Perlite & Vermiculite: Due to the nature of their surface and structure, both Perlite and Vermiculite has the ability to trap as well as drain moisture, along with providing excellent aeration. Which makes them excellent ingredients for a seed starting mix. Peat Moss: Peat Moss has a high retaining water capacity, good martial for aeration and holding fertilizers. It considered a base for any mix for growing vegetables. Coconut Coir: Can be a substitute for peat moss cause it a renewable source which means it is eco-friendly. Starting mixes made of a mixture of Perlite or Vermiculite and Peat Moss or Coconut Coir, are an excellent medium for high seed germination and healthy seedlings. Each material proved seeds with the ideal water, oxygen and texture conditions for germination. There you have it. You now know why you should use a seed starting mix for your indoor sowing for next season or indoor gardening. Now what needs to be done is experimenting with the product above. Yes, other gardeners may say this or that is better than the other, but in the end, see the best for you and stick with it.